the super fresh food industry. Specialist in conditioned transport of super fresh products for retail and food service. Sliced vegetables, cream puffs, salads, cheese, fresh fruit; you name it, we transport it. Well, if it concerns super fresh products that need to be transported very fast and chilled. That is what our logistics solutions are designed for. 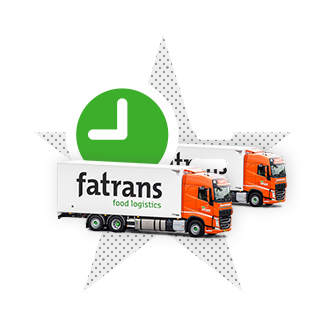 Our drivers supply the distribution centres and supermarket chains in the Netherlands, Belgium and Germany, with fresh products. Safely, competently and efficiently. We are looking for drivers. Interested? Come on then! Supermarkets want fresh produce on their shelves. 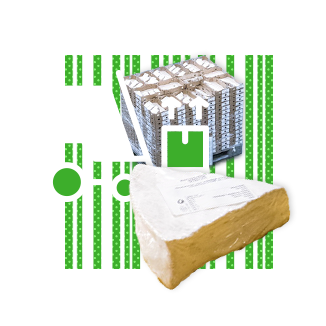 Therefore, transportation of these products needs to be quick and of high quality. And that is what we focus on every day. We work with short lines and we act quickly. From groupage transport for the large retail chains to delivering individual pallets to the food service industry. Therein lies our expert strength. But you can also count on us where it concerns the transportation of full shipments. With 10,000 m2 warehouse on three strategic locations, we have everything we need for your storage, transshipment, cross docking, stock management and order picking. Your high-care products are stored safely and flexibly at the right temperature. This way, your products will stay fresh and of high-quality. We also offer overall customer solutions, from the full supply chain. We take care of the entire logistics operation. From sorting, storage, order picking, repackaging, to labelling and packaging. This way, you can go ahead with your own business. Two pallets with sliced vegetables for two retail DCs within twelve hours in the east and west of Germany? Of course! No problem. Because of our extensive network in the Benelux countries and Germany, in combination with our very elaborate groupage possibilities, we can offer you a daily service to the distribution centres of renowned retailers in Germany and the Benelux countries. Small and large volumes, delivered quickly and punctually. Conditioned transportation requires a constant check of the quality and food safety of your products. Securing quality and safety is therefore an integral part of our policy. All business processes are IFS certified; proof that we have the key factors regarding food safety and product integrity, under control: from traceability to effective measures for critical control points, observing hygiene requirements and food defence. Our employees receive extensive instructions about the quality and safety measures and we also ensure continuous (further) education. We transport your goods with the best material available. We drive as clean as possible (Euro 6 engines) and continuously invest in our vehicle fleet. Low usage costs and CO2 limits are important criteria upon purchase. Every day, we have over 50 trucks and trailers on the road going to destinations in the Benelux and Germany. We offer reliable custom-made refrigerated transport solutions in various temperature categories. Our trailers are equipped with state-of-the-art coolers that guarantee an optimum and constant temperature. This way, every product reaches its destination quickly and at the right temperature. Partly because of our many years of logistics experience and practical knowledge of the food industry, we can quickly and ingeniously translate your specific transport needs into a carefree logistics solution. Are you looking for a logistics partner for warehousing and transportation of your fresh products to Germany, the Netherlands and Belgium? We are based in Dronten, Venlo and Amsterdam. You are very welcome. Get in touch with Dennis Blom.